As standards and core curriculum differ by state and sometimes even by district, A+ STEM Labs embraces a flexible approach that provides a range of experiments and activities that map to the programs you already have in place. There is no “one way” or “right way” to use our labs. Our solutions are designed to support and enhance your curriculum of choice, letting you focus on the subjects and core competencies most relevant to your classroom. 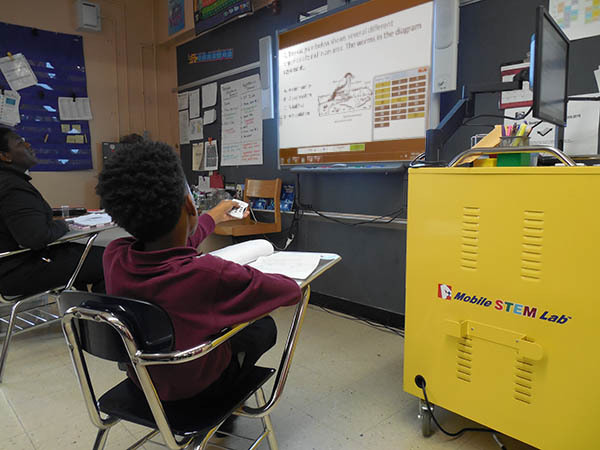 7th Graders take a Living Environment assessment test with help from an interactive student response system, part of their classroom’s A+ STEM Lab for Science.